Broad host range of more than 500 crop and weed species that spans worldwide. 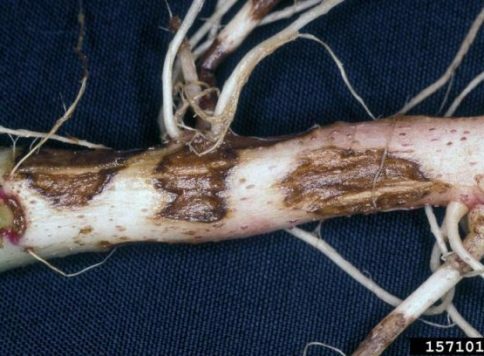 Survives indefinitely in soil as fine fungal strands. Most common in soils of low fertility and microbial growth. 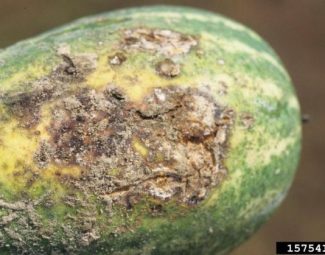 Trace element deficiencies can increase susceptibility of crops. 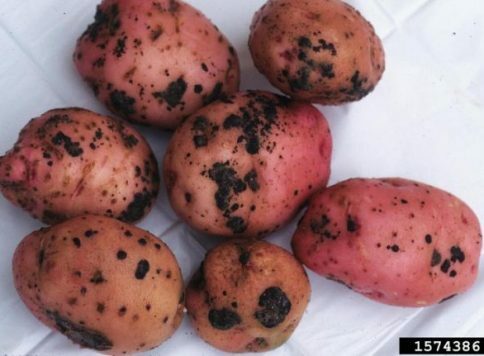 Higher rate of incidence in fields with reduced tillage. Barley more susceptible than oats. 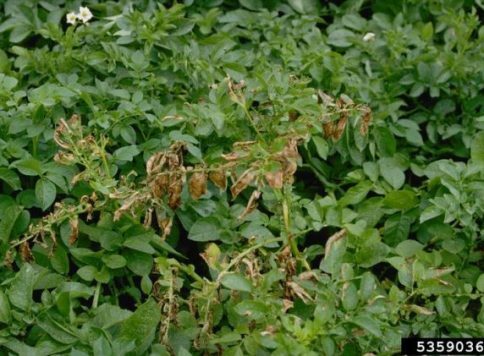 Responsible for stem and stolon canker in potatoes, contributes to pod rot in peanuts. 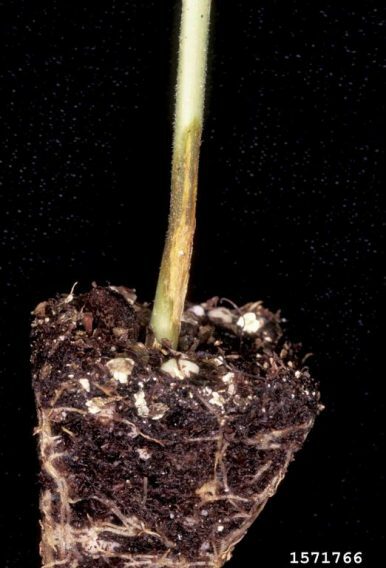 Rhyzoctonia, along with Fusarium and Pythium are major contributors to “damping off” seedling disease. Does not posses ability to produce asexual spores. 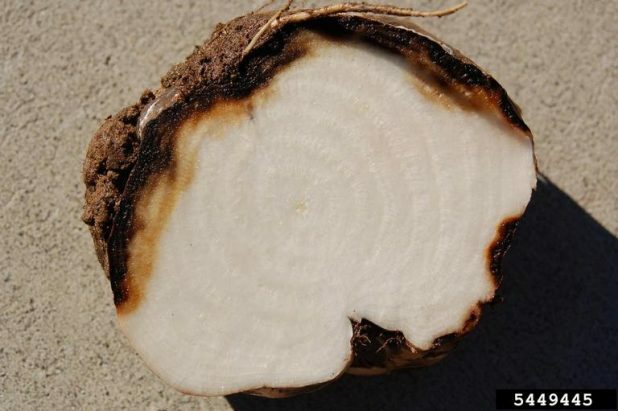 Produces sexual spores during times of high moisture when environmental conditions are favorable for survival. Primarily exists in the soil in the form of mycelia. Mycelia feed on dead plants and organic matter (saprophytic) until suitable live tissue from available host roots become available. 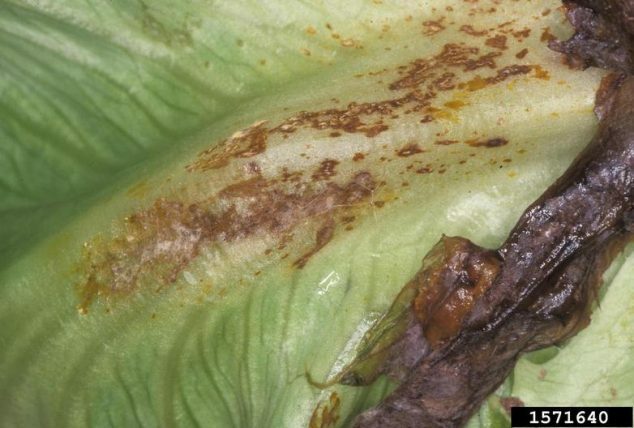 Mycelia are initially clear or white, and turn tan or brown as growth increases and thickens. 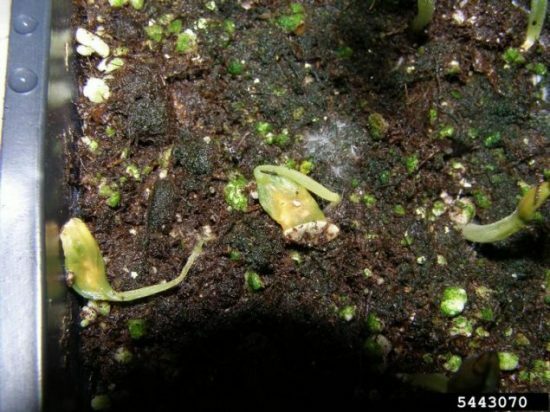 Infect host by colonizing seeds or young seedling roots. Hyphae from mycelium penetrate hosts and produce enzymes that break down host tissue. 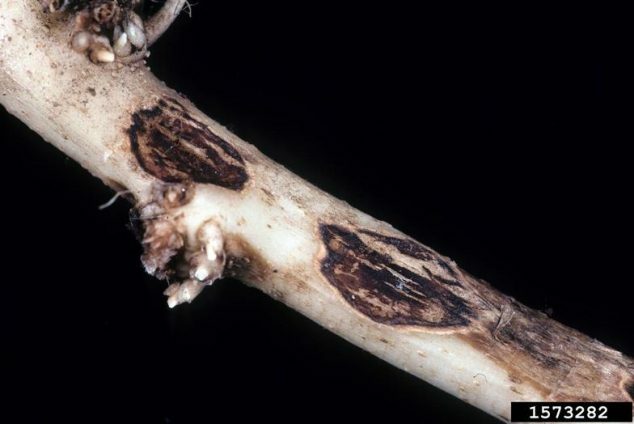 Surviving plants may form reddish-brown canker rots on stems and/or roots. Produce sexual spores that are dispersed by wind. Hyphae that grow from spores fuse with one another to create strands of mycelium. 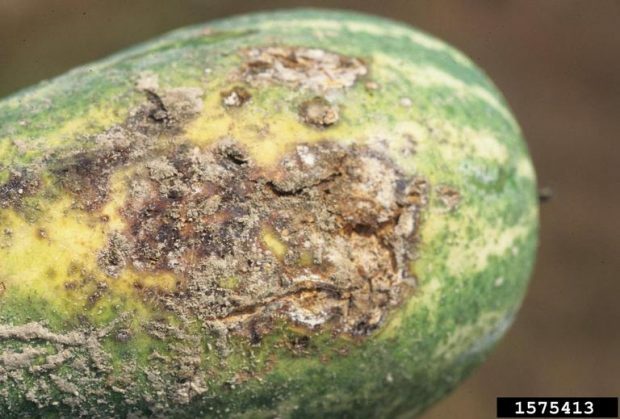 Can infect vegetative and fruiting structures that lie on or are in close proximity to soil. 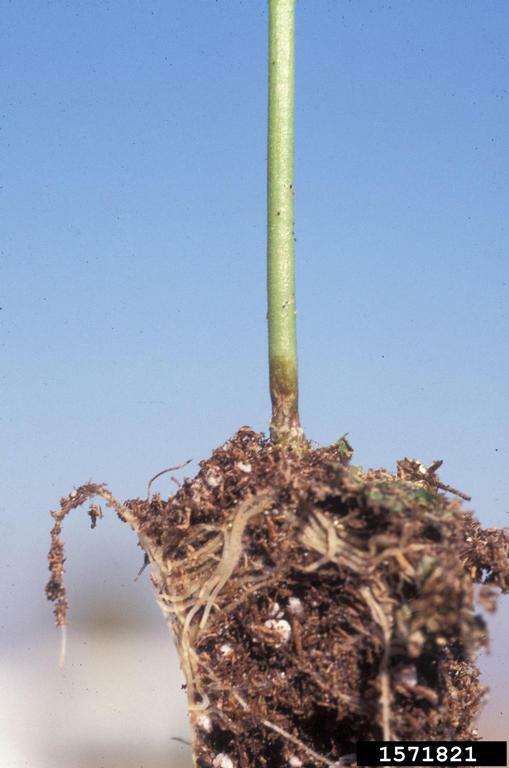 Sexual spores can cause rotting of structures higher up on plants during times of high moisture conditions. 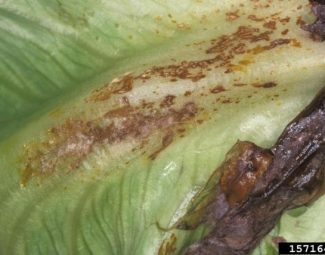 Survive during periods detrimental to growth by producing strands of mycelia called “sclerotia”. 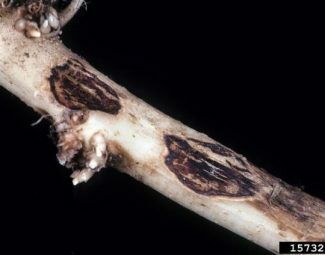 Sclerotia are brown to black in color and are capable of surviving many years in near dormancy. 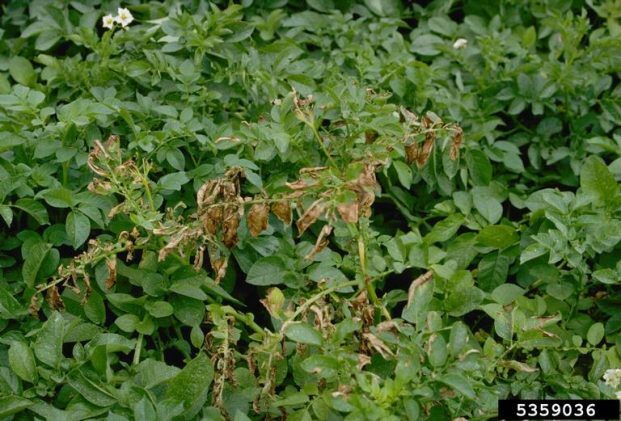 Avoid or minimize factors that contribute to proliferation of inoculation such as: inoculated irrigation tail water from infected fields, poor drainage, dirty machinery, wind, erosion, transplants and seeds that are infected with Rhizoctonia, and mechanical and/or insect root injury. 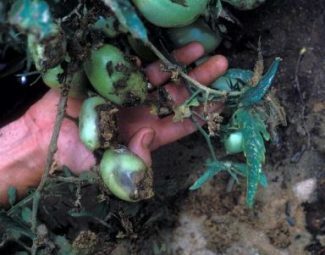 Create conditions for maximum breakdown of organic residues before planting to reduce additional inoculation and propagation sites. 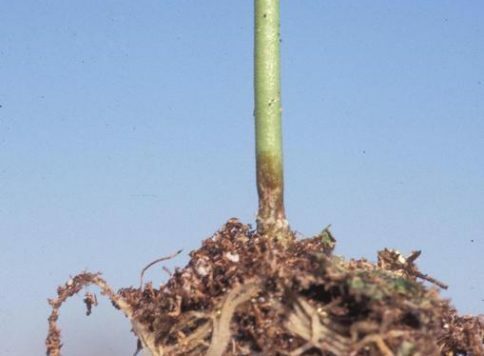 Tillage before planting has been shown to reduce rates of infection. 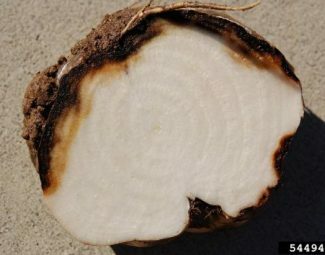 Plant in areas of good drainage and aeration. Avoid planting densities that inhibit good air movement. 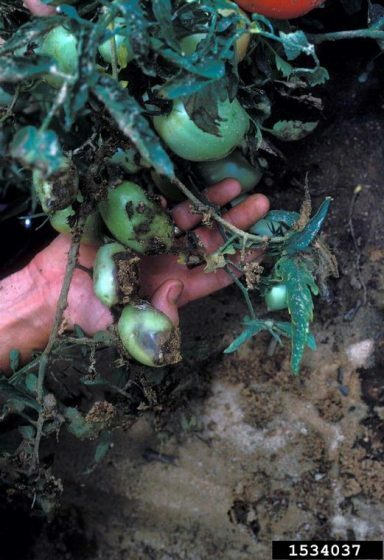 If possible, remove symptomatic plants as soon as they are identified. 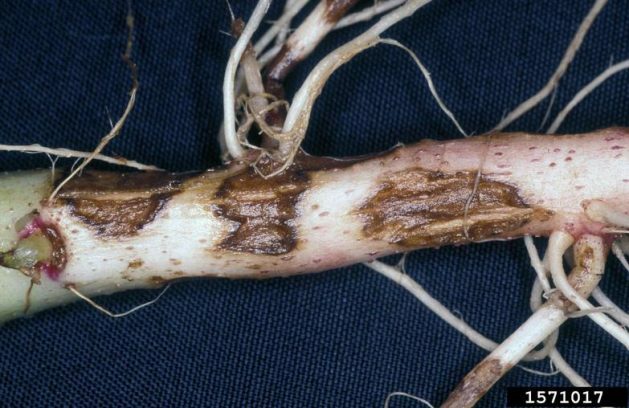 Plant cultivars that have been identified as being relatively Rhizoctonia resistant. 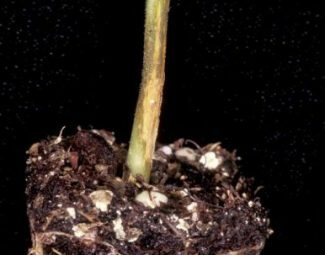 Rotate to species of plants that are more Rhizoctonia resistant.